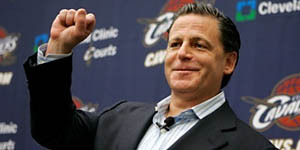 About 15 minutes after the Dallas Mavericks defeated LeBronJames and the Miami Heat in Game 6 of the 2011 NBA Finals, Cleveland Cavaliers owner Dan Gilbert sent a message on his Twitter page to Mavericks owner Mark Cuban, a statement that included a shot at LeBron. Obviously, Gilbert is still steaming over what transpired last summer when James left the Cavaliers and joined his good friends Dwyane Wade and Chris Bosh in Miami. Gilbert accused James of quitting in the playoffs the past two seasons and, moments after LeBron made The Decision to take his talents to South Beach on ESPN, the Cavs owner promised that karma would prevent James from winning a championship and predicted his Cavaliers would win their first title before “the self-proclaimed King” won one. He can thank the Mavericks for keeping the “Curse of White Man from Town” alive. But Gilbert wasn’t the only one who posted a message on Twitter shortly after the Mavs defeated the Heat in Game 6. I own domain name lebronjamescurse.com holler at me if you interested in buying. You may be able to sell some stuff and make millions. Email only if you are serious LillieMcGWard@msn.com then we will make live contact.